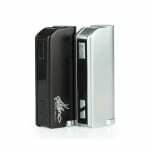 Sorry, IPV Mini 2 Box Mod has been discontinued. This very popular upgraded version of the IPV Mini 30 Watt maintains the same size and shape, but offers a 70 Watt maximum power output that is much better equipped for sub-ohm atomizers of all resistances. The IPV Mini 2 features a Yihi SX330V2C Chip that allows this regulated mod to acheive the 70 watt output. This very popular upgraded version of the IPV Mini 30 Watt maintains the same size and shape, but offers a 70 Watt maximum power output that is much better equipped for sub-ohm atomizers of all resistances. The IPV Mini 2 features a Yihi SX330V2C Chip that allows this regulated mod to acheive the 70 watt output. The IPV Mini 2 will work with atomizer of 0.2 ohm resistance and above. Also features a USB port for easier charging, short circuit protection, reverse battery protection, low resistance warning and low voltage warning. The IPV Mini 2 has a 510 connection threading with a floating top pin that ensures that all RDA and RBAs will sit flush on top of the mod. Really nice for dripping or cloud chasing when paired with a good rebuildable setup. This device requires 1 x 18650 battery by Efest, Samsung, or Sony, available for separate purchase from 180 Smoke. The IPV Mini 2 does NOT come wih a battery.